This article was published in Jeff Ooi's CY's Lenses before, sadly this and many other stories were lost when the old site got hacked! If you come to Wellington, do pick up a free copy of the "Escape Planner 2005 on Wairarapa", according to this excellent little guide book; Wairarapa is "Over the hill and a world away." You can "Wind your way along the route trodden by early settlers 150 years ago, over the Rimutaka Hills to the place Maori called Land of Glistening Waters." Sounds like LOTR Middle Earth country? Looking at the stunning colour shots in the guide book, you bet! Sad but true but for Asians like yours truly and Mrs, all these splendor of only 90 minutes drive away; we only visit ONCE a year and only during the famous "Martinborough Fairs" on the first Saturday in February and March! On those days, Martinborough's population is set to expand tenfold when 25,000 people descend on the town square for the record number of 490 stalls selling everything from handicrafts to wine and food. An event not to be missed! All these years I always wondered what Martinborough is like on a quite weekend, there are no special attraction or event to entice us driving there; especially when you have to strain your car up the Rimutaka Hills with part of the ascent NOT "Amcoed" (Amco barrier). Some stretch are fenced though, my friend reckoned it must be Kiwi humor to try and stop cars dropping hundreds of meters with fence made of wooden STICKS and chicken wires! 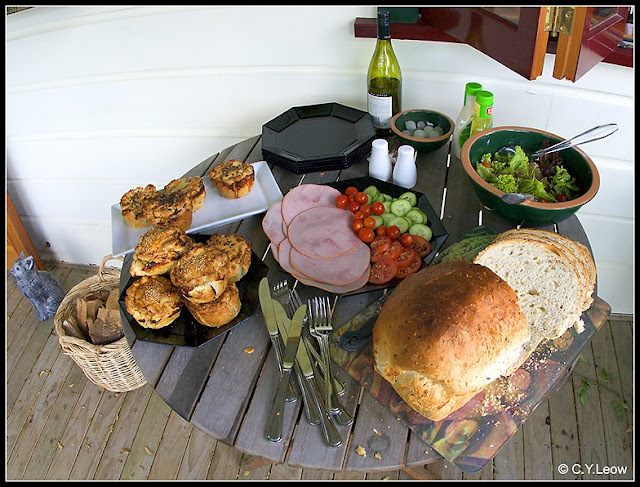 That aside, I jumped at the opportunity when my "lady boss" Audrey Fenton invited us to visit their two cottages in Martinborough and have lunch there! So on a sunny Saturday, we headed for the hills; the hill climb was as I remembered in 1988... the "sticks" supported by chicken wires are still there! The climb was more pleasant in my Mazda 3 than my 1.5 Civic when I drove up the same hill way back in 1988, still; the 2,000 DOHC Mazda still call for 2nd gear at some stretch! Two charging WRX roared pass me, four-wheels traction rules! Took me slightly more than an hour to reach Featherston, immediately after entering the town you take a right for Martinborough; but before you do; you might want to have a snack at the Lady Featherston Cafe on the left, before the turn off. The last time we were here I had the "Hobbits Lunch" and the Lady served some mean beef pies! Yummy Kiwi fare! Check out those PIES!! Click on the picture and salivate! Ten minutes after the Featherston turn off you come to a "T" junction, take a right for Martinborough, you might want to stop on the left and view the "scenic lookout" of a classical New Zealand landscape. We did, and I took a shot. 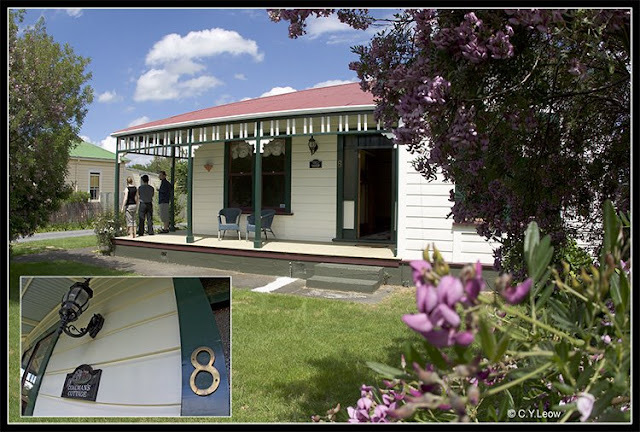 Home On The Range, the main stay of N.Z. economy. We arrived at the first cottage, the "Coalmans"; Andrew and Audrey Fenton owns the beautiful cottage and it is for rental! Andrew told me that his Coalman's Cottage "takes it's name from it's early use as the local coalman's residence. Recent owners spared no expense in lovingly restoring the villa to a high degree of perfection! 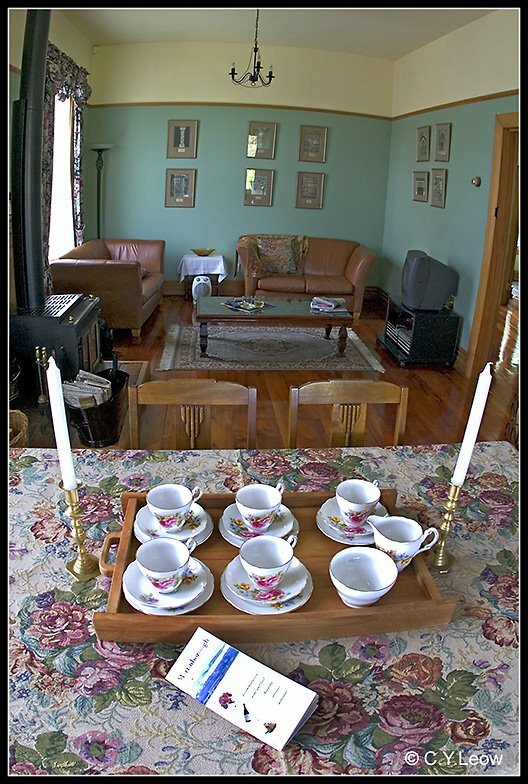 While the kitchen is modern and luxurious the rest of the house retains the character of the 1920's with polished matai floors, fireplaces and decoration of the era. As I walk past the master bedroom I saw little Kate Fenton testing out the bouncy bed! I grab a few quick shots with my "old" Canon D60. A slow 1/15 and full f2.8 @ ISO 400 was use with the fish-eye. 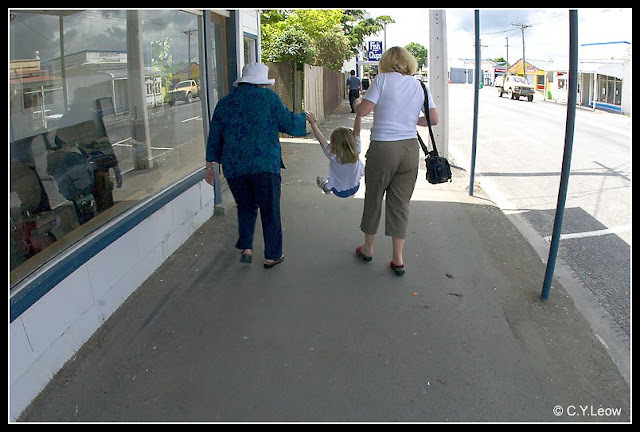 After lunch we all went for a walk "in town", if you had visited the Martinborough web site; you realised that the town is a square with 7 streets on the X-Y axis. You will also be pampered by the serenity and delighted by some fine cafe and antiques shops. On our way back to the Coalmans we stop to look at the second cottage, the "Hollyhocks". Little Kate was in front of me and for a fleeting moment she stop and look back, my D-60 shutter went off. The candid "grab" really bring out the lovely charm of the cottage. What do you think? "Hollyhock" by the way, is a flower that was first bought to this country from China where they are used for medicinal purpose for chest complaints. We head back to Wellington at 4.00 pm but like Arnold's famous last worlds... "I'LL BE BACK!" * "Ah Beng" is what the Penangnites call the BOY RACER type drivers :-) But in Singapore Ah Beng is "a no-nonsense simpleton stereotype that usually wears anything with bright-neon-colors like hand-phone, hair, car, etc." How many times you get a chance to see your picture on a Christmas card? Martinborough is picturesque and steeped in history, We went last year and the small townshop was almost deserted. The trip over has its own delights.. all you need to remember is pick a nice day,drive carefully,pack a lunch(or secure an invite LOL)and make sure you go to the toilet before you leave ,,, because the toilet at the top is permanently locked now.... and make sure you take your camera. 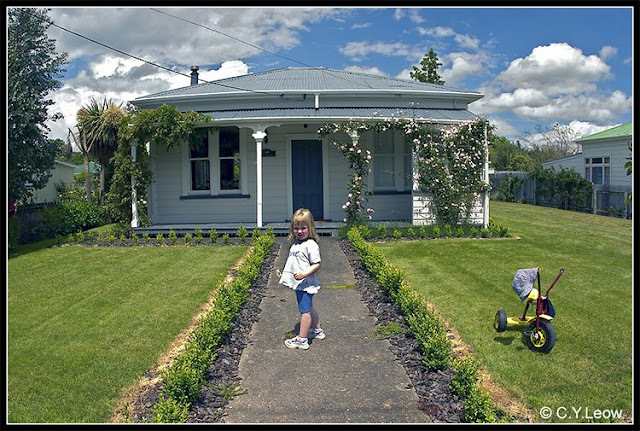 Your exhortation to visit Martinborough is equally valid for Kiwis as it is for overseas visitors.It`s "another world" over there and it doesn`t have to be an expensive outing. Kiwis are all too keen to holiday offshore when New-Zealand is beckoning them to "come and see". 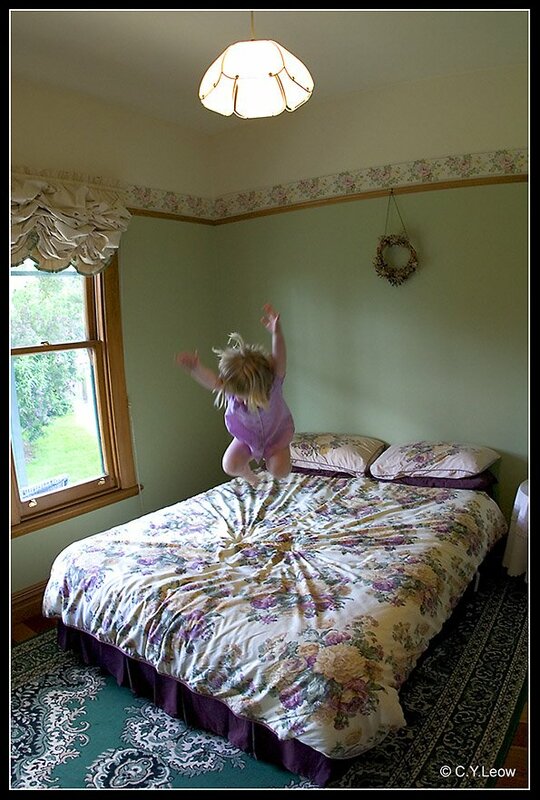 The photos are so cool.Kate jumping on the bed,,,ha ha..Shes grown so much, I dont think she would get away with it now.